VATICAN CITY (CNS) — Hopes for Christian unity may not be spring fresh, but Pope Francis’ fall calendar is filled with ecumenical appointments. Pope Francis will open his season of ecumenical engagements Sept. 20 when he joins other Christian leaders and representatives of other religions in Assisi to commemorate the 30th anniversary of St. John Paul II’s interreligious peace gathering. Ten days later, Pope Francis flies to Georgia, a predominantly Orthodox nation. In October, he will meet and pray with Anglican Archbishop Justin Welby of Canterbury and, at the end of the month, he will fly to Sweden to take part in ecumenical events launching commemorations of the 500th anniversary of the Protestant Reformation. The message the pope’s calendar conveys is that “no matter what the new and old differences are, we are still bound together by a common baptism and so many elements of common faith and the common obligation to share the Gospel,” said Bishop Brian Farrell, secretary of the Pontifical Council for Promoting Christian Unity. Taking opportunities to pray together and making commitments to engage in joint social and charitable works should “create a climate of greater trust, which will help us confront theological differences with confidence and a better understanding of each other,” the bishop said. The pope’s visit to Assisi is scheduled to last just eight hours. But standing alongside Archbishop Welby and Orthodox Ecumenical Patriarch Bartholomew of Constantinople — as well as Jewish, Muslim, Buddhist, Hindu and Sikh leaders — will be an affirmation of a shared belief that true faith always seeks peace. The climate of his visit to Georgia may not be quite as warm as Pope Francis is used to. Although Orthodox Patriarch Ilia II invited the pope to visit the country and will meet with him the first day, the pope and patriarch are not scheduled to attend each other’s liturgies, which has become a common practice when the pope visits a predominantly Orthodox country. Patriarch Ilia, 83, was elected head of the Georgian Orthodox Church in 1977 when Georgia was still a Soviet republic and the communist government was placing severe restrictions on the practice of faith. Hundreds of churches and monasteries had been closed, but under Patriarch Ilia’s leadership in the 1980s, the church began to rebuild and grow. In his early years as patriarch, the Georgian Orthodox Church also was actively involved in the ecumenical movement and Patriarch Ilia served as a co-president of the World Council of Churches. After the Soviet Union dissolved and as Georgians began recovering their ethnic and cultural identity — an identity closely tied to Orthodoxy since the fourth century — there was growing criticism of the modern ecumenical movement and its perceived tendency to equate all expressions of Christianity. The Orthodox Church of Georgia withdrew from the World Council of Churches in 1997. When representatives of the world’s 14 Orthodox churches were preparing to meet in Crete in June, the Georgian church was one of the first to announce it would not participate. The Georgian church’s synod cited a proposed document on relations with other Christians as one of the reasons it stayed away. 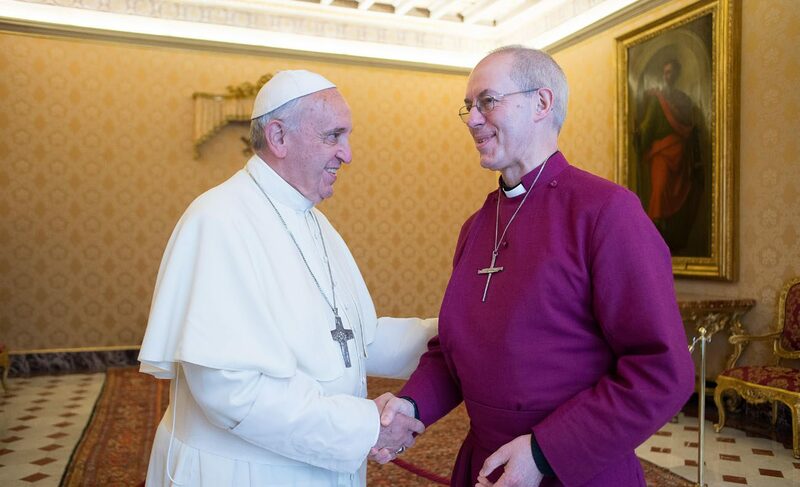 While the theological and moral issues separating Catholics and Anglicans are more profound that those impacting the Catholic-Orthodox relationship, Archbishop Welby’s visit to the Vatican is expected to be warmer, to include prayer with Pope Francis and the signing of a joint declaration. The Anglican archbishop’s visit to Rome marks the 50th anniversary of formal Anglican-Roman Catholic dialogue, the 50th anniversary of the Anglican Center in Rome and a major meeting of the International Anglican-Roman Catholic Commission for Unity and Mission. The pope’s fall ecumenical activities will culminate in Lund, Sweden, Oct. 31 when he participates in a Catholic-Lutheran commemoration of the 500th anniversary of the beginning of the Protestant Reformation. Instead, the document “From Conflict to Communion,” urges Catholics and Lutherans to recognize Martin Luther wanted to reform the church, not splinter it. After 500 years, it said, Christians may find it easier to see and experience their differences, but the world is in need of a united Christian witness and the season for that is now.